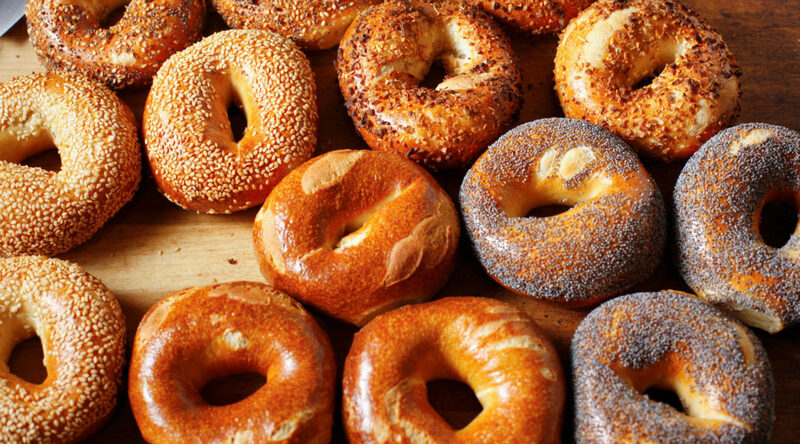 There’s the basic Plain Bagel, then Poppy, Sesame, Onion and even Pumpernickel – Bialys too. After that it starts to get a little crazy – blueberry? cinnamon walnut? jalapeno? Well, I guess there’s something for everybody. As a New Yorker, it goes without saying that I like bagels. All New Yorkers do. We grew up with them. It’s a standard New York practice for mothers to give their babies a smooth plain bagel for teething. With butter or a schmear* and coffee for breakfast or with Nova** for lunch, it’s perfect. Go to a New York event – a seminar, corporate meeting, workshop – if it’s in the morning and it’s catered there will be bagels. And if it’s just muffins, there will be complaints. When I was in the army and stationed in the South in the late 1960s, I tried to order a bagel in Augusta, Georgia. The response was “What’s a bagel?” I was offered a honeybun instead, which wasn’t bad. But now, at least they know what bagels are, even if honeybuns are still more popular. Without getting into too much history, I can say this – the bagel originated in Eastern Europe, it’s Jewish and the name is Yiddish. New York City bagels are supposed to be the best in the country because of our water. Maybe that’s true and maybe it isn’t but when friends visit, having a New York bagel is on their list of things to do because, they say, they can’t get a good one back home.